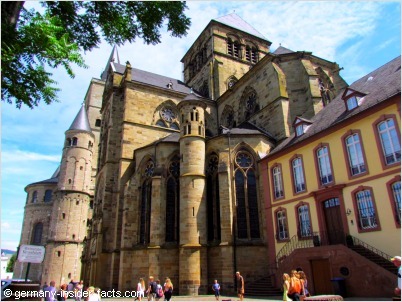 In Trier, the oldest city in Germany, visitors can explore 9 UNESCO World Heritage Sites which are summarised as Roman Monuments, Cathedral of St. Peter and Church of Our Lady. The most familiar site is the mighty city gate Porta Nigra. However, it is not only the historic importance that makes Trier a favourite destination for travellers. The city's location in the Mosel valley, surrounded by vineyards and the hills of the Eifel and Hunsrück, make it a top holiday spot. With such a long and fascinating history, it is no surprise that many school classes have an excursion to Trier on their agenda. 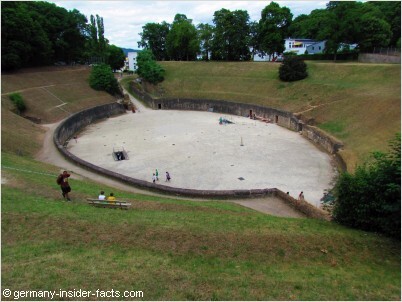 I can't remember many details from my school trip, but I know I enjoyed the Amphitheatre with its arena undergrounds. 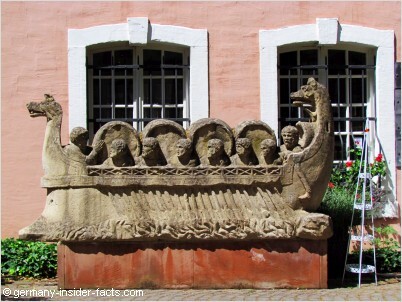 Let me take you on a journey to Augusta Treverorum, which was Trier's name during the Roman era. 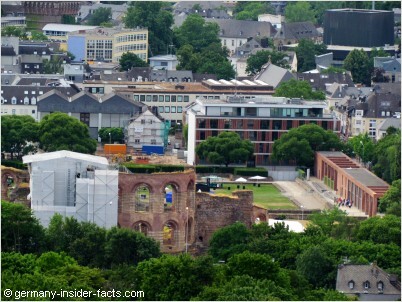 Overview of Trier's history - How old is the oldest city? Legend has it that Trier was founded (long time before the Romans arrived) by Trebeta, the stepson of the Assyrian Queen Semiramis. Ante Romam Treveris stetit annis mille trecentis which means "Trier stood 1300 years before Rome". This inscription can be found on the facade of the Red House, and it was also mentioned in the Gesta Treverorum, the history deed from the Middle Ages. In my opinion, the wealth and infrastructure of the Roman era is the most fascinating epoch in Trier's history. Public baths, aqueducts, water pipes, no wonder Trier was one of the most important cities within the Roman empire. 58 BC to 50 BC - The Treverer, or Treviri, were a celtic tribe in the area of present-day Trier. They came under influence of Roman culture after the Gallic Wars, when Romanisation of the conquered regions began. 30 BC - After an unsuccessful uprising by the Treverer, a Roman military camp was established on Petrisberg, the first evidence of Romans in the area. 17 BC to 16 BC - A wooden bridge over the Mosel was built and a settlement developed. 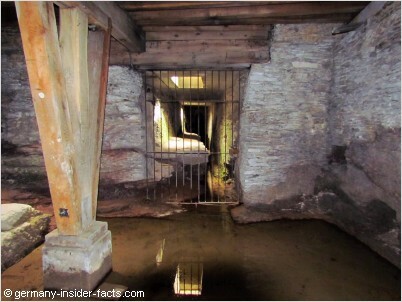 Burial finds and wood samples prove the date of Trier's founding. It was the beginning of "Augusta Treverorum", the City of Emperor Augustus in the land of the Treveri. The city was later renamed Treveris, and finally Trier. 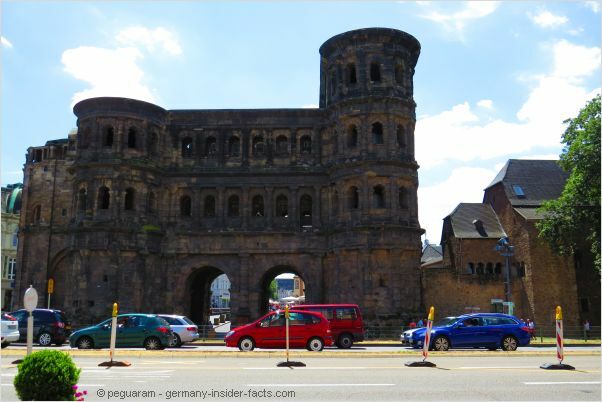 During the 2nd century AD the Porta Nigra, Barbara Baths, the Amphitheatre and a city wall were built. Between 142 and 150 AD a new wooden bridge with massive basalt pillars was built, the predecessor of the Römerbrücke (Roman bridge) we know today. The first stone vaults were erected in the 12th century. 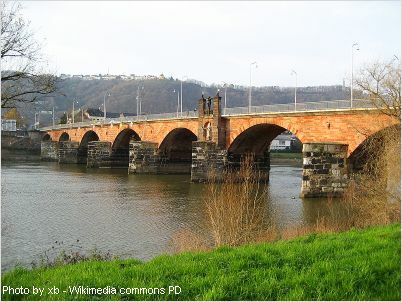 During the 18th century the upper part of the bridge was blown up by the French, and rebuilt again. It is amazing that the Roman pillars still bear modern traffic. Trier's boom continued during the 3rd century. Its inhabitants became Roman citizens and the city an imperial residence and seat of the Gallic Prefecture. However, there was a short setback from plundering Allemanni in 275. In the 4th century, Treveris was the largest Roman city north of the Alps, with a population around 50,000, some sources even say up to 100,000. The Roman audience hall (now known as the basilica of Constantine) was built. After Constantine I. adopted Christianity, construction of a huge cathedral began. A Trier bishop was first mentioned in 314. The slow decline of Treveris and the Western Roman Empire began at the end of the 4th century. During the following decades Trier was badly damaged by the Franks a few times. 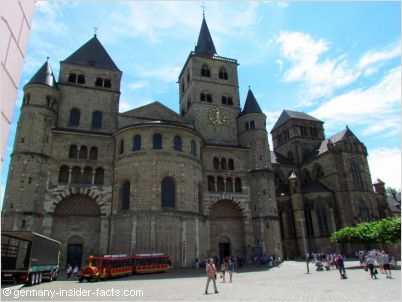 Around 800 - Following Charlemagne's church reform, Trier became an archdiocese. 882 - Massive destructions of urban structure by the Vikings. 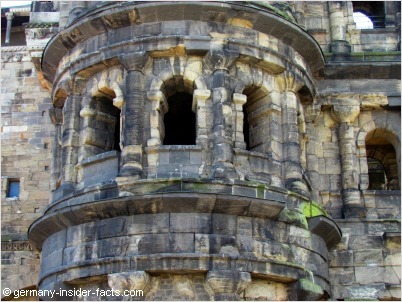 1030 - The Greek monk Simeon had himself locked up in the Porta Nigra to become an hermit. After his death he was soon canonised, the city gate was turned into a double church. The fact that Simeon was also buried in the Porta Nigra, might be a reason that the building did not share the fate of other Roman buildings being used as a quarry. 1248 - Completion of the medieval city wall, the city area was only half the size of the Roman city. Under Archbishop Balduin of Luxembourg Trier's political influence grew again in the 14th century. 1618 - 1648 During the devastating Thirty Year's War, Trier's population declined to less than 4,000. 1797-1814 - After several wars with France, Trier was annexed to France. After that period, it became part of Prussia. 1818 Karl Marx was born in Trier. Of course, the most important sights include the architectural treasures which are listed as an UNESCO World Heritage Site. Built about 180 AD, this is the only remaining city gate, and Trier's most famous landmark. The original name is not known, the medieval name "black gate" was given because of the black patina of the grey stones. The huge arena was built 100 AD for games with gladiators and animals. 20,000 spectators could be seated, which shows the importance of Trier at that time. The Amphitheatre was also a place for gatherings and religious events. Watch out for the lions behind the gate! In the vast cellar prisoners and wild animals were kept. These days you can take a tour with a gladiator to explore the cellar and dungeons. The cathedral is the oldest bishop's church in Germany. 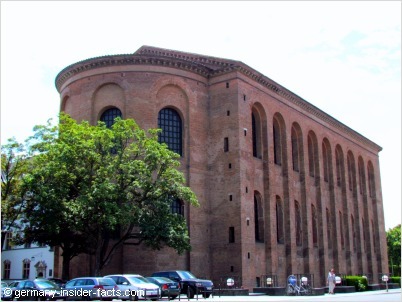 It was built above a Roman palace to become the largest Christian Church in the 4th century. Today's Dom, although much smaller than the Roman cathedral, still contains a Romain section with original walls up to 26m. Artworks and architecture from more than 1700 years can be admired in the crypts, the cloister and treasury. Built in the 13th century, this is the oldest Gothic church in Germany. The church replaced the southern Basilica of the ancient Roman cathedral, which was ramshackle. The Liebfrauenkirche still has a Roman foundation, but nothing Roman above ground. Although this impressive building has been used as a Protestant church (the oldest in Catholic Trier), the name is somewhat misleading. The huge single-room hall was the throne room of Constantine the Great. 27m wide, 67m long and 33m high, the hall was built to express the magnificence and power of the emperor. 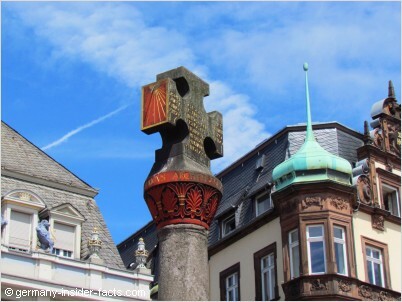 There is so much to see in Trier, you can spend several days in this amazing city, especially when you want to visit some of the fantastic museums as well. The best way to get around is a tour with the Trier hop-on hop-off bus. The red double double-decker bus takes a loop around the city, you can get off and on the bus as often as you want. One loop takes about 1,5 hours. The bus operates daily from April to October, every 30 minutes from 10am to 5pm. Tickets are valid for 24 hours from the first use. Bus stops are: Porta Nigra, Zurlaubener Ufer (city dock), Barbara Baths, Amphitheater, Constantine Basilica , Karl Marx House, Petrisberg. Archaeological Museum (Rheinisches Landesmuseum), Weimarer Allee, is the largest Museum in Trier. Please note: Most museums in Germany are closed on Monday. No need to feel bad if you don't want to spend all day with culture and history. 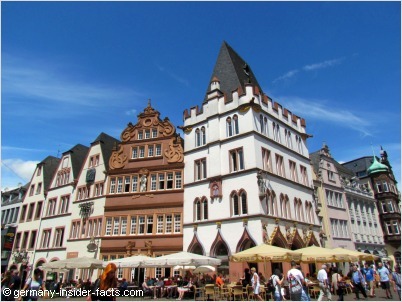 Trier is a wonderful place for shopping and leisure. Heaps of restaurants and cafes invite you to relax and watch the world go by, especially in summer when you can sit outside. How to get to Trier? Trier is well connected by motorways and main highways. From Saarbrücken, Kaiserslautern, Cologne or Koblenz take the A1 / A48 motorways, or the A64 from Luxembourg. Additionally, you can take Bundestrassen for a leisurely drive along the Mosel valley, the Hunsrück or Eifel. The Michelin Germany Midwest Map 543 can help you with planning the route. Trier can be easily reached by train from main cities and towns in the region. There are regional trains (RB) from Koblenz, Saarbrücken, towns in the Mosel valley. You can check the DB website for connections. If you plan a day trip from a location within Rhineland-Palatinate or Saarland, the Rhineland-Palatinate Länderticket (valid for Saarland too) can save you money. Trains from Frankfurt main station or the airport take about 3 and a half hour, and you have to change trains at least once. 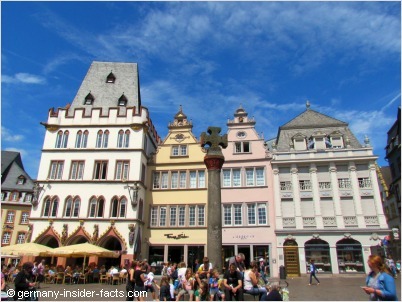 If you are not in the mood to figure out train connections from Frankfurt, there is a guided tour that takes you to Trier within 2 and a half hours. Relax in an air-conditioned coach and enjoy the landscapes passing by. Included in the tour price are the entry fees to the Amphitheatre and the Imperial baths. 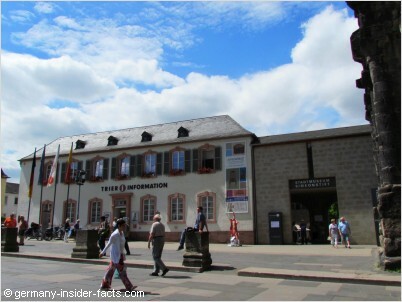 There is an excellent tourist information centre next to the Porta Nigra. They can provide all info you need about city tours, events and attractions. Contact them for any requests regarding your visit. There is also much more information (in English) about sights and places to see on their website. After so much sightseing you need a cosy hotel. Use the search box to find your lovely hotel in Trier. Enjoy your stay in Trier, the oldest city Germany!